Tackling problems of race in contemporary Cuba, through the voices of researchers, officials, musicians, painters, and the Cuban people. The film’s objective is to serve as an open reflection on the subject as well as a recognition of the sociohistorical and cultural role of black Cubans in the formation and consolidation of Cuban identity. Basado en la problemática racial en la Cuba actual, a través de las voces de investigadores, funcionarios, músicos, pintores y población en general. Con el objetivo de servir de reflexión abierta sobre el tema y, a su vez, como reconocimiento sociohistórico y cultural del papel de los negros en la formación y consolidación de la identidad cubana. This tour is dedicated to the life and work of Angela Gilliam, a true friend of the Cuban Revolution. 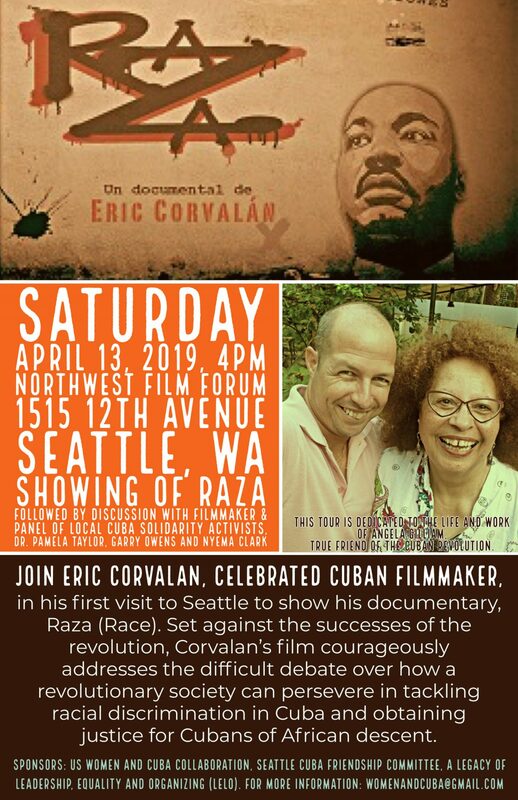 Eric Corvalán is a celebrated Cuban filmmaker with numerous films and awards to his credit, including Raza (Race) 2009, about challenges for the Revolution in race relations and justice for Cubans of African descent, and Huellas (Footprints) 2018 about violence against women. Corvalán is a native of Cuba whose heritage is Chilean and French. He appears frequently at international and domestic conferences and film festivals to screen his films, participate on panels, and present keynote addresses related to his film projects and interests, which currently include explorations of race, and gender and family violence. Corvalán has a degree in Audiovisual Communication (Film, Radio and Television) from Havana’s Higher Institute of Art, and his current professional focus is on producing independent documentaries. He is a member of UNEAC (National Union of Writers and Artists of Cuba), the National Audiovisual Association in Cuba, SGAE (General Society of Authors and Publishers, in Spain), and a General Campaign of the UN: Join to End Violence Against Women. He is currently working on a book, Raza: Chronicles of a Filming.